Smart retailers know that omnichannel customer experience isn't just about marketing anymore. It’s about bridging all your digital and physical channels to recognize customers wherever they are, collecting data and understanding the retail customer’s purchasing journey. By taking customer data, product data, and supply chain data - and applying predictive and prescriptive analytics - your omnichannel analytics strategy can be so much more! It’s allowing the retailer to apply analytics to every step of the customer journey. To be able to give that customer a much better experience, not just in terms of how we market to her, but also in terms of the ideal product assortment in each location, whether it be in-store or online. And also, how much and where the optimal inventory should go so we can satisfy that customer’s needs wherever she wants to shop. The key to head-turning customer experiences is using customer analytics to transform a simple multi-channel strategy into true omnichannel initiative. The results make it possible to accurately sense customer motivation and action in near real-time, including the use of behavioral information to determine customer engagement strategies all along the customer journey. We all want to feel memorable and special, but equally important is we want things to be easy. Online, in-store, by mobile, on your favorite social media app, or however you connect, retailers must be tuned-in to your behavior and preferences to command your attention. 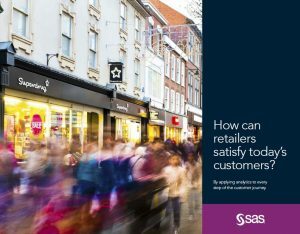 But it's not simple, says Wilson Raj, SAS Global Director of Customer Intelligence: "Sheer complexity and volume of customer data require analytics that go beyond traditional reporting to predicting customer intent and behavior at the moment of engagement." Nearly six in 10 survey respondents—58 percent—say their companies have seen a significant increase in customer retention and loyalty as a result of the use of customer analytics. Just over half the survey respondents say their use of real-time customer analytics has provided them with a significantly better understanding of, and strengthened, the customer journey. Nearly half the survey respondents say their use of customer analytics has generated significant revenue growth. How does your customer experience strategy stack up? One of the biggest mistakes companies often make is aiming customer analytics at the wrong targets: the most active or engaged customers, rather than the customers with the greatest lifetime value. Ultimately, leaders are focused on making more customer-focused decisions and taking customer-centric actions at greater scale across their operations, allowing them to design more personalized and relevant customer interactions, improve accuracy in demand planning and product and service availability. If you want to test your real-time marketing maturity, check out the paper, Real Time Analytics: The Key to Unlocking Customer Insights & Driving Customer Experience.